This really is a beautiful island with superb coastlines. Trying to do some sightseeing in the mornings before it gets too hot. The rest of the time we are in the sea. Going to see the caves later this week. Love Jo & John. * Sorry, but I haven’t got your address with me. Puerto Pollensa still looks very much the same, although 30 years on there are more boats in the harbour and they seem slightly larger! I’m a bit worried about the coach that appears to be hanging over the edge? 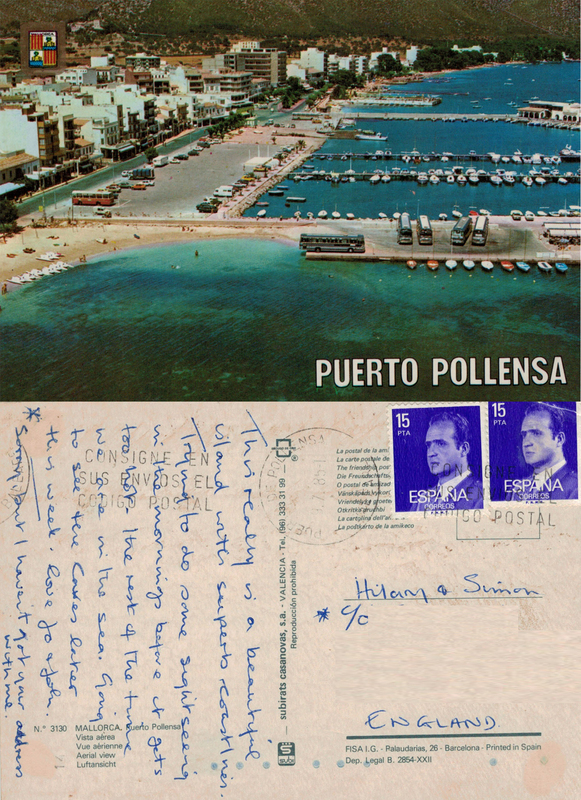 My earlier post card from Mallorca was dated 1974, this one is post marked Puerto de Pollensa 9.7.85 and once again the caves feature as a day trip. Simon and I had just bought our first place together, so I had officially left the family home to where this card was sent, hence the asterisk and apology. John was my mum’s cousin, and Jo his wife. They sometimes looked after my brother and me when my parents went out. They taught us to play various card games and excitingly there was always a pot of pennies that were used to make the games more interesting. We remained close to Jo and John as we grew up. Sadly, Cousin John died some years ago, but I still see Jo at family events. This card is 33 years old but the design seems very contemporary – good design is timeless, I guess. 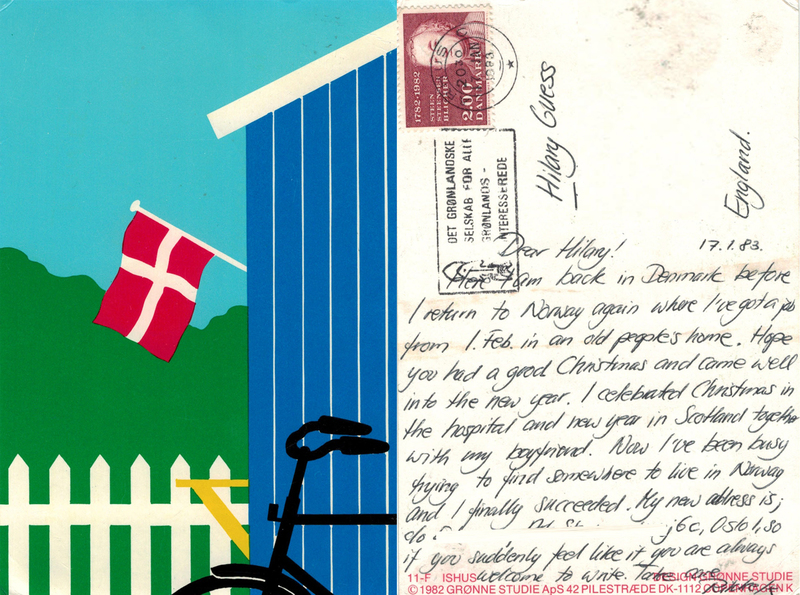 Obviously the bike and of course the Danish flag immediately indicate where the card is from, and the colours suggest fresh air, seaside and clean living – things that are associated with Denmark. It really is a great piece of artwork. The command of English achieved by many non-native speakers always amazes me – look at the use of the apostrophe in ‘old people’s home’ – there are many born and bred with apostrophes who still would not manage that! Without these small notes (status updates, if you like) we would have lost touch – the reason for sending me the card was to tell me the new address. People travelled and moved around, as they do today, but if you wanted news and to keep friendships alive, the effort required was considerably more than the click of a mouse and a smiley face! A classic view of the Kent harbour town of Ramsgate, which still looks much the same today. The postmark date is 4 Aug 1982. 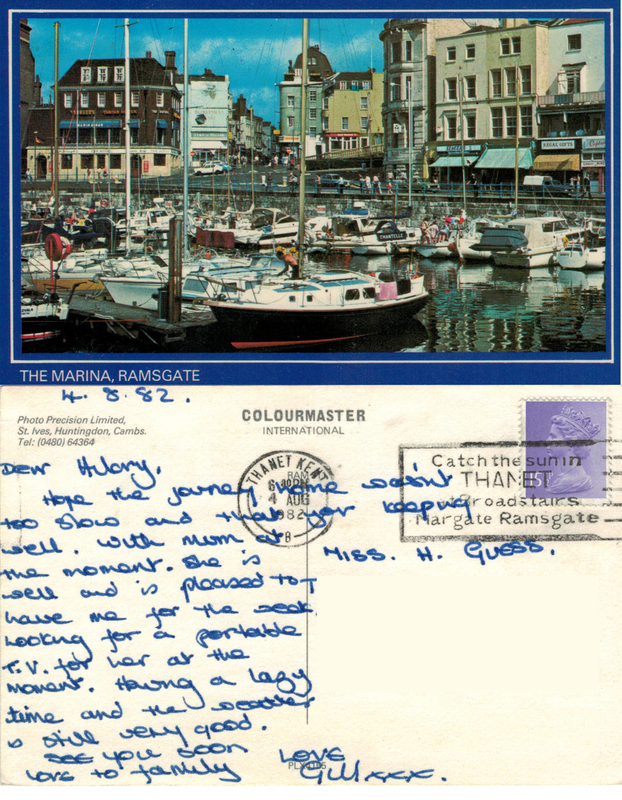 The other postmark is advising us to ‘Catch the sun in THANET Broadstairs Margate Ramsgate’ – popular seaside destinations, depending on your point of view. I first met Gill in 1977 at a ‘street party’ organised by the families in my road to celebrate the Silver Jubilee of Queen Elizabeth 11. 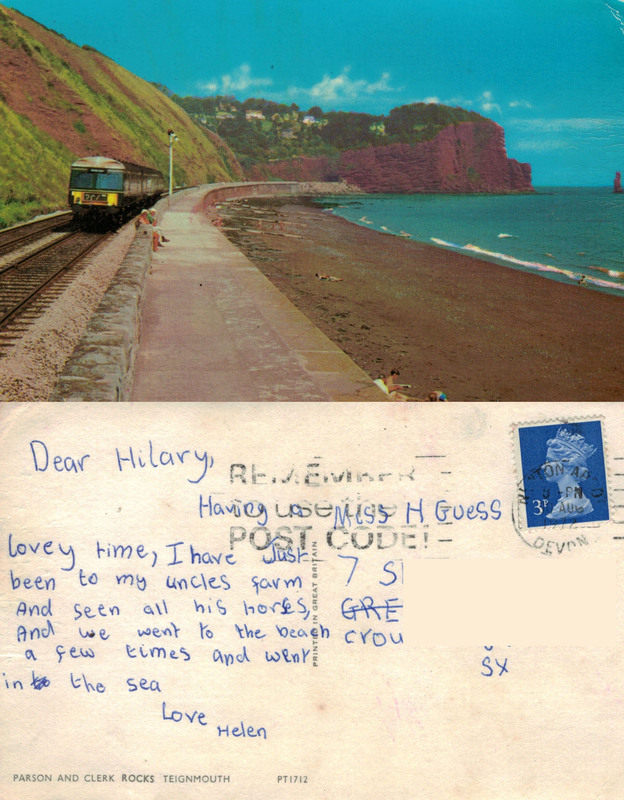 Gill was a young friend of our neighbours’ who regularly came to stay with them, and as we were the same age we struck up a friendship – both staying conscientiously in touch via letter. 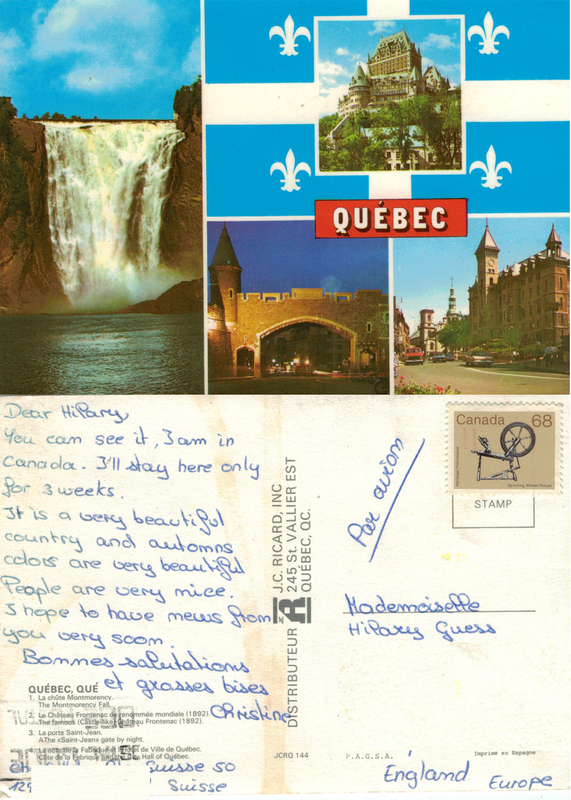 This card was sent just after I had seen her in London, where I had visited her on my return from Norway. Living in her father’s flat in London and having a full time job in London she seemed to me to be the height of sophistication – I was still trying to decide what to do with my life. Gill has been a loyal correspondent and we are still in touch, via cards, email and the odd phone call, although it is now many years since we actually met up. 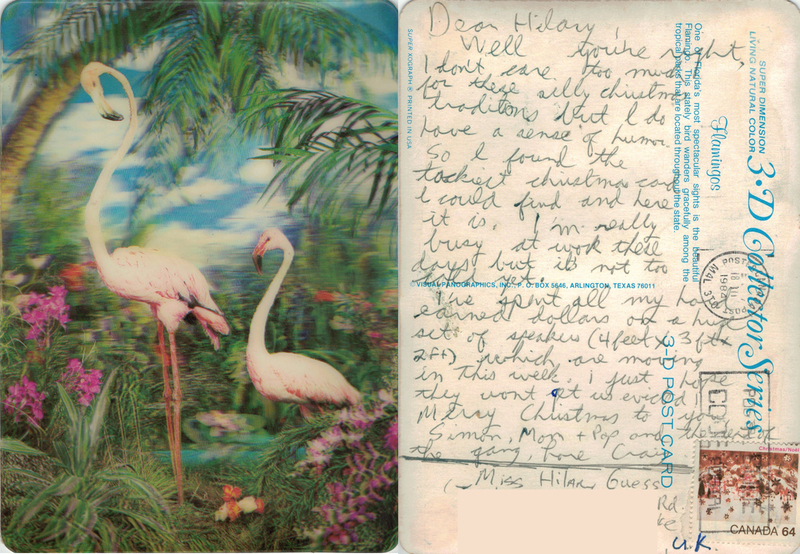 Although this card is sent from Toronto the 3D image is of Florida’s flamingos. It is apparently part of a 3D collector series. Craig was my first love; he came over to the UK to study for a year. He went back to Canada, I went to Norway. We wrote long letters to each other. I went to Canada, we had some adventures. He was younger than me; I wanted happy ever after; he wasn’t ready; I moved on. We stayed in touch intermittently for several years. Then one day his mum phoned to tell me that he had died (tears are pricking as I write this), he did not reach 30. No old, bald paunch for him – forever young and forever in my heart. A lovely Northern European illustration sending good wishes for Christmas and New Year. 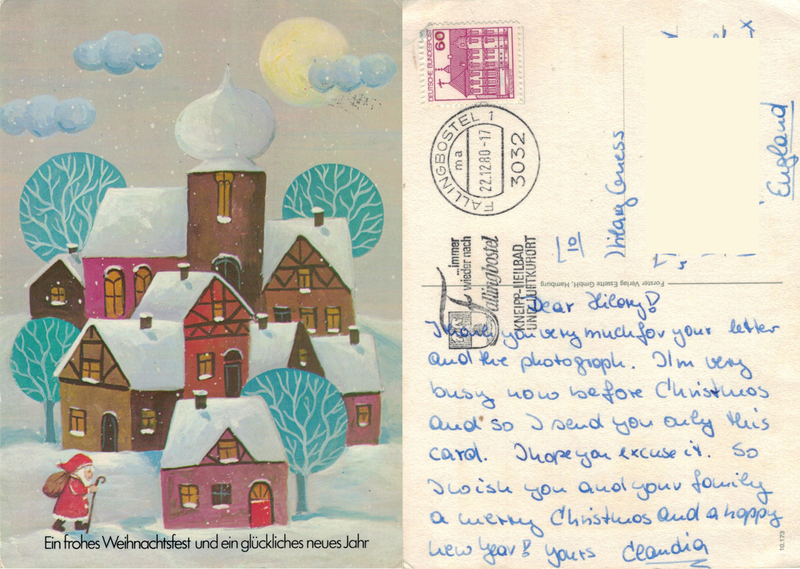 The postmark date is 22.12.80 so it probably arrived after Christmas. Claudia and I became ‘pen pals’ when we were at senior school. I would write to her in German and she wrote in English. Claudia’s English was far superior to my German, so eventually we just communicated in English. She was a conscientious correspondent often writing lengthy letters about her life. We met for the first time when I was in Norway and she planned her inter-rail trip to include Oslo. Then in the mid nineties (after 20 years of exchanging news) Claudia went quiet, no letters, cards, Christmas cards – nothing. I tried to contact her parents by letter and more recently have searched social media sites without success.